Three passengers were killed and 10 others injured as driver of Chittagong-bound bus from Dhaka lost control of it on the highway at Sitakunda and rolled over on road divider. This photo was taken on Wednesday. Separate road crashes in the port city of Chittagong and on the Dhaka-Chittagong Highway have left three people killed.Police said that, at least 10 others have been injured in the mishaps, involving buses, on Wednesday.Two of the dead have been identified as a 40-year-old woman Jesmin Akter and Md Zulfikar, 60.The other victim, estimated to be 35 years old, is yet to be identified. 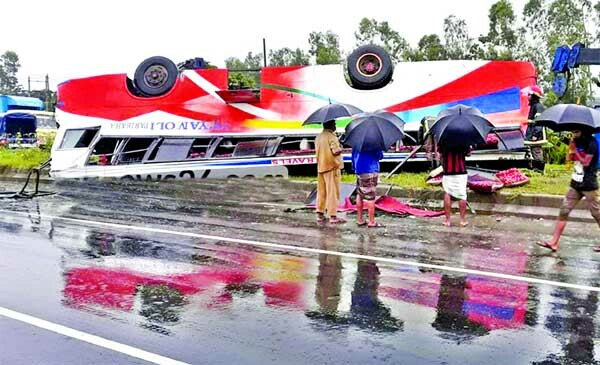 Highway Police's Sergeant Nizamul Fahmi said a Chittagong bound bus from Dhaka lost control on the highway at Sitakunda and rolled over on the road divider. "Zulfikar and the unidentified man died on the spot; at least eight others were injured in the accident which occurred around 6am," he told bdnews24.com. In the port city, a bus hit a tree on a street near the polo grounds around 11am. Traffic Sergeant Md Jalil said that three passengers were rushed to the Chittagong Medical College Hospital where the doctors declared Jesmin Akter dead.